In 1994, white rule in South Africa came to an end with the election of Nelson Mandela to the presidency, and the South African Reserve Bank issued new rand notes which reflected the new political and social landscape of the country. 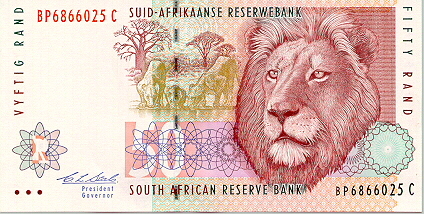 The post-apartheid notes depict the "Big 5" tourist attractions in South Africa on the obverse, while the reverse sides feature images which reflect South Africa's major industries. 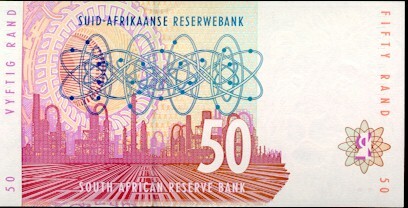 The green (R10), brown (R20) and red (R50) colour schemes of the old rand notes were maintained, with blue and orange being introduced for the R100 and R200 notes. The old R2 and R5 notes were discontinued and replaced with coins. Old coins and notes remain legal tender. The notes issued from 1994 to 2005 were in English and Afrikaans, with Afrikaans being the first language on the R10, R50 and R200 notes, and English being the first language on the R20 and R100 notes. 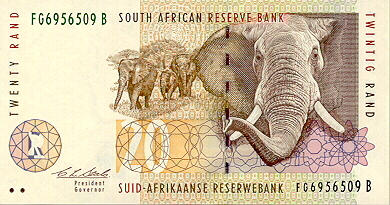 In 2005, the South African Reserve Bank issued updated rand notes, incorporating new security features, slight changes to the note designs, and adding South Africa's eleven official languages to the notes. The new notes maintained the motifs and colour schema of the 1994 notes. 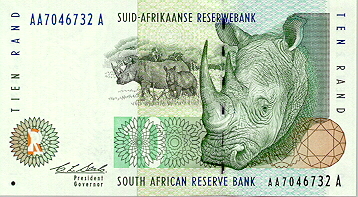 In including all 11 official languages across the five notes, English is retained on the obverse of all notes, with "South African Reserve Bank" and the amount. 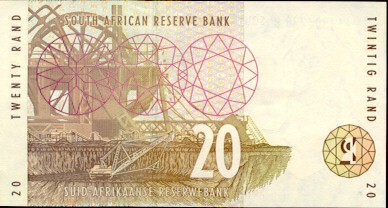 The reverse of each note has "South African Reserve Bank" in two official languages. 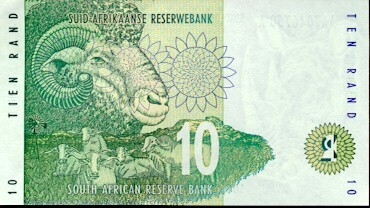 Having two official languages on each of the five notes allows the ten languages to be equally exposed.